“Success Talks: Conversations with Everyday Leaders” brings together eighteen everyday leaders from a variety of industries and professions to share their unique experiences and insights of leadership in business today. 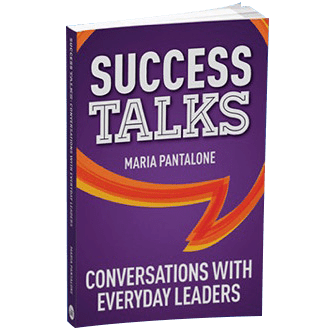 Maria Pantalone captures this leadership advice in informative conversations that contain many practical tips for leaders and aspiring leaders to achieve career success. This fresh approach to comprehending leadership is delivered with entertaining real life examples. 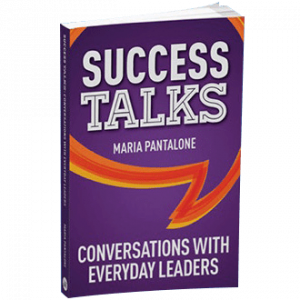 From this, readers can clearly decipher the common traits of successful leaders and their perspectives. Organised into clear, relevant and brief sections, this leadership advice is easily understood and can be efficiently applied to your daily working life, aid your business communication proficiency, widen your level of influence, and advance your power of persuasion skills. Among the eighteen contributors included are Juliana Nkrumah—Order of Australia recipient; featured in Shaping the Nation: 100 Women who have helped shape Australia and the 2014 Who’s who of Australian Women; Jim Fraser—Australian World Cup Soccer team; Judith McDonald—PADI (Professional Association of Diving Instructors) Scuba Instructor, and 2012 Western Sydney Business Woman of the Year; and Nathan Williams—Australia’s leading expert in canine behaviour.